AT&T First Floor Lobby and Café Renovation « Davis & Associates, Inc.
Davis & Associates completed the general trades package associated with the renovation of the AT&T headquarters’ first floor lobby and working café’ located in downtown Indianapolis, IN. 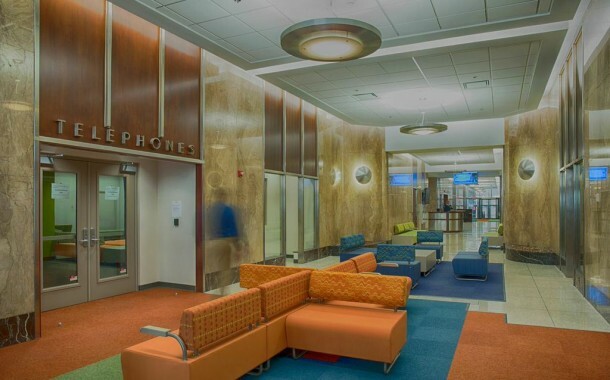 This renovation involved remodeling of finishes, revitalizing spaces, and modernizing four entrances to the building. It is also converted over 4,200 s.f. of outdated office space into a state of the art working café. The general trades package included: general conditions, rough carpentry, doors, frames and hardware, automated doors, coatings, and finishes.